The Spartan Showcase 99370-31 self-service pastry merchandiser holds four 18-inch-by-26-inch pans on four white wire shelves. These shelves support airflow around products and brighten the interior, and the white finish fits into almost any design scheme. Vertical lights enhance product presentation, while glass end panels and hinged doors enable guests to view product from various angles. 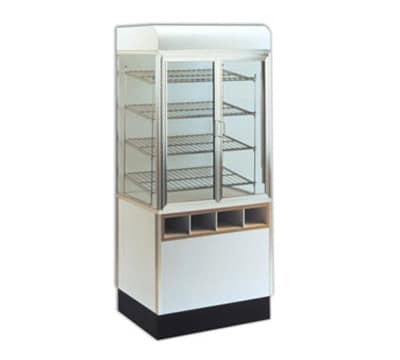 An anodized aluminum frame and a 6-inch kick base provide the Spartan Showcase 99370-31 self-service pastry case durability.